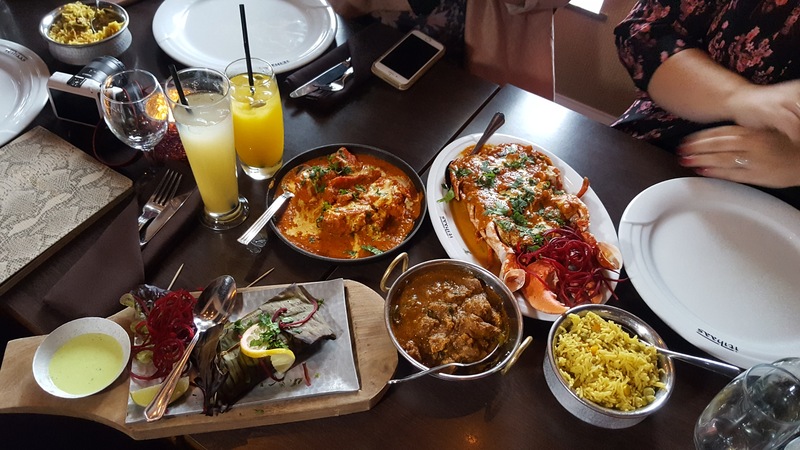 Last month on the blog, I posted a raving review on the wonderful food and service I received at Itihaas Restaurant in Birmingham. I recently returned with a group of bloggers, for the launch of the new menu and to see whether Itihaas would live up to my first experience. This was extremely important to me as I despise inconsistency in a restaurant, bar or hotel. 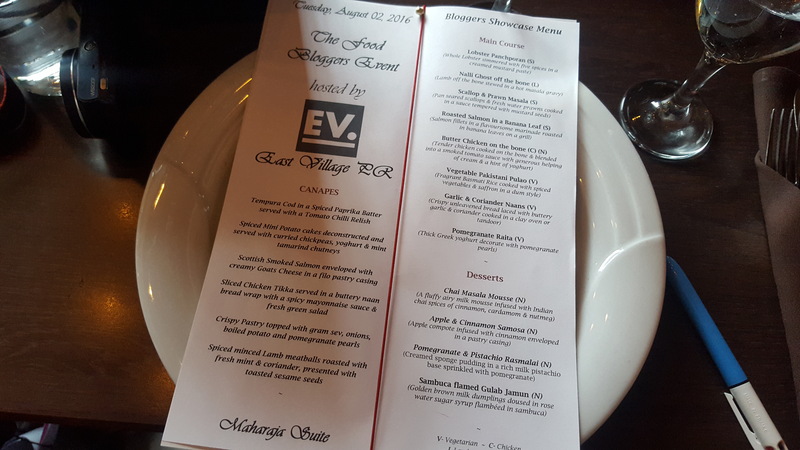 The evening was kindly hosted by Tara Tomes of East Village PR and Executive Chef and Proprietor Raj Rana. East Village PR have recently taken over Itihaas’ Public Relations and communications. I arrived around 7pm on a sunny, Birmingham evening and was promptly welcomed and greeted. I was treated to a glass of sparkling wine and made my way to the basement where the bloggers dinner was being held. Normally when the word basement is uttered, you would normally think dark and dingy. This is far from the case, as it’s well lit with natural light and looks out onto the canal. On this floor is the kitchen, dining room and a couple of private dining rooms. There is also the dining room on the ground floor. Before our mains were served we were able to mingle, have a nosy around the venue and taste some canapes and cocktails. The canapes were nice, but the chicken Tikka wrap and salmon and goats cheese samosa weren’t my favourites. The chicken Tikka was tasty, but the presentation in a wrap was a bit simple. Whilst I like salmon, I like goats cheese and I like samosas. Together not so liked. The cocktails on the night all had one thing in common, Vodka! Torunska Vodka was the base of all the cocktails on the night. Apparently I don’t really like Vodka, but I think I’m secretly lying, as I am yet to find one Vodka based cocktail I do not like. When matched and balanced beautifully it creates a subtle elegance to what would otherwise be a somewhat bland juice. As it was a weekday, I decided to limit myself to one cocktail and I managed to pick a really good one that also packed a punch. The Kaffir Lime Martini was very refreshing and exactly as a Martini comes – strong! It was a nice cocktail to show off the Torunska Vodka as the cocktail wasn’t to complicated, it showed the Vodka to be smooth, easy drinking and without a burn. The main courses all really stood out, and there was nothing on there that I wouldn’t order again. I really enjoyed the lobster and scallops, both creamy, fragrant and lightly spiced. I really enjoyed that they were not overcooked. A real delight for me as seafood can often be murdered by a chef. I can assure you they were cooked to perfection. The food just kept coming out and it was very nice being able to share the food with the other bloggers as this is how best the food is enjoyed. The desserts were tasty, but I never have enough space for desserts. With this in mind, if you are a slow eater like me and enjoy chatting, allow yourself two hours so you can carefully indulge in one of the puddings! All in all, I left full, very satisfied and happy that Itihaas remained consistent in quality of food, service and knowledge. 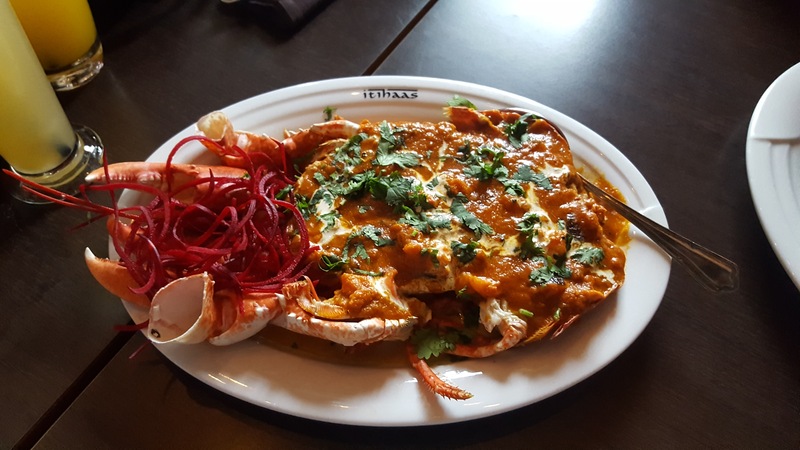 Itihaas is on the pricier side for Birmingham, but with that said the food is of sound quality. Itihaas is definitely a place I’d go for a treat. under a colonial interior backdrop. Canal views make for a romantic date.